For the Greek government with the same name, see Provisional Government of National Defence. The Government of National Defense (French: Gouvernement de la Défense nationale) was the first government of the Third Republic of France from 4 September 1870 to 13 February 1871 during the Franco-Prussian War. It was formed after the Emperor Napoleon III was captured by the Prussian Army. The government, headed by General Louis Jules Trochu, was under Prussian siege in Paris. Breakouts were attempted twice, but met with disaster and rising dissatisfaction of the public. In late January the government, having further enraged the population of Paris by crushing a revolutionary uprising, surrendered to the Prussians. Two weeks later, it was replaced by the new government of Adolphe Thiers, which soon passed a variety of financial laws in an attempt to pay reparations and thus oblige the Prussians to leave France, leading to the outbreak of revolutions in French cities, and the ultimate creation of the Paris Commune. When the Franco-Prussian War began in 1870, France was under the control of Emperor Louis Napoleon III. A National Assembly was based in Paris, but its powers were limited. Widespread discontent amongst Assembly members before the war, particularly amongst socialist members, had given Louis-Napoleon many enemies. At the disastrous battle of Sedan, Louis-Napoleon was captured by the Prussian Army, leaving France effectively without a government. When news of Louis-Napoleon's capture reached Paris, leading members of the National Assembly rushed to the Hôtel de Ville to declare a new government. At the Hôtel de Ville, Léon Gambetta publicly declared the founding of the Government of National Defence on September 4, and the government immediately assumed control of all affairs in France, intending to continue the war against Prussia. Despite the hopes of revolutionary, radical left-wing politicians in Paris, the Government of National Defence was composed almost entirely of middle-class, conservative men, who were already Deputies in the National Assembly representing Paris constituencies. When offered the post of President, Jules Trochu accepted it based on the Assembly's promise that they would "resolutely defend religion, property, and the family". The new government was almost entirely middle-class, and citizens of Paris wondered how long the uneasy alliance between the revolutionary left-wing Republicans and the conservative right-wing Republicans would last. The Government of National Defence quickly received official recognition from leading world powers in the following days, except from Prussia. The Prussian Chancellor, Otto von Bismarck, was concerned that the new body could not act as France's government, as it was composed entirely of men from Paris, without any consideration being given to the rest of France. This was not a great concern to the Government though, as its members intended to continue the war against Prussia. With most of the army captured at Sedan, the Government of National Defence called almost all military units from across France, including marines, naval units, and troops on foreign service in Rome, Algeria, and French colonies, to aid in the defence of Paris before the Prussians reached the city. The Government greatly increased the already formidable fortifications around Paris and brought in vast quantities of food from the countryside, to feed the swollen population of the city throughout the expected siege. Having sworn in General Trochu as President, the National Assembly left Paris and relocated to Bordeaux. Concerned that the rest of the country might complain about the Parisian-dominated government, Admiral Fourichon and Gaston Cremieux, both elderly men, were dispatched to Tours as a representative delegation on behalf of the government in Paris. By September 20 1870 Paris was completely surrounded and cut off from the rest of unoccupied France. On October 7, Léon Gambetta left Paris by hot air balloon and arrived in the city of Tours, from which he and his deputy Charles de Freycinet directed the war across unoccupied France. Although they were part of the same national government, the governments in Paris and Tours often acted without consulting each other, due largely to the problem of communication between besieged Paris and the outside world. The National Assembly in Bordeaux had very little say in government affairs, as they had no reliable means of contacting Paris and Gambetta did not have time to wait for the Assembly to debate issues. As a result, Gambetta became the virtual dictator of unoccupied France during the war. Throughout the siege, the Government of National Defence was reluctant to try to break out of Paris, and as the siege wore on, the population of Paris grew more and more frustrated at the Government. The government did in fact try to break out twice, once in late November 1870 and once again in mid-January 1871. The "Great Sortie", beginning on the night of November 28, was a cataclysmic disaster. Thousands of soldiers were killed and the population of Paris, whose hopes had been raised far beyond rationality, were shattered by the news of the sortie's defeat. Blame was heaped upon the Government of National Defence, and increased through December as the city's food supplies began to run out. The population was angry that the Government was suspicious of the National Guard based in Paris - whilst the civilian population saw the National Guard as an unstoppable force, the Government perceived them as a rabble of ill-disciplined drunks who would run away at the first shot. When the Government decided to placate civilian sentiment by using the National Guard in the next sortie of 18 January 1871, their suspicions were confirmed as the National Guard panicked and fled back into Paris, provoking the civilian population to blame the Government for being incompetent and cowardly. After the failure of the January 18th sortie, it was obvious to the Government that they would never break out of the city. In addition, food stocks were running dangerously low and the city was enduring constant artillery bombardments from the Prussians, and although the shelling was surprisingly ineffective, its demoralising effect on Paris was severe. The Government sacked General Trochu as Governor of Paris on January 22 (although he remained President of the Republic) and replaced him with the elderly General Joseph Vinoy. Jules Favre, though, held real control, and became the de facto leader of the government. A small revolutionary uprising on January 23 was crushed with force by the Government of National Defence, further infuriating the population of Paris. On January 28, 1871, Paris surrendered. Favre, on behalf of the Government of National Defence, and Bismarck signed a Convention on the Armistice and the Capitulation of Paris. Under this Convention Favre agreed to humiliating terms demanded by the Prussians, including the payment of 200 million francs indemnity within a fortnight, over 5 billion francs in total war reparations, and the surrender of the strong fortresses surrounding Paris. In Tours, Gambetta received the news of the surrender by telegram on January 29, and although he still wished to fight on, was convinced to step down by a group of diplomats who arrived from Paris by train on February 6. The negotiations had guaranteed national elections to create a new French government, and on February 8 1871 French citizens (except those in the occupied Prussian territories) voted for a new government. The elections returned an overwhelming number of conservative, middle-class, rural Deputies, who set up a new seat of government at the palace of Versailles. The new National Assembly elected Adolphe Thiers as Chief Executive of the new government, and Thiers took over the position of President of France from General Trochu on February 13. Eager to pay reparations and thus oblige the Prussians to leave France, the new government passed a variety of financial laws which deeply angered Parisians, leading to the outbreak of revolutions in French cities, and the ultimate creation of the Paris Commune. The Franco-Prussian War or Franco-German War, often referred to in France as the War of 1870, was a conflict between the Second French Empire and later the Third French Republic, and the German states of the North German Confederation led by the Kingdom of Prussia. Lasting from 19 July 1870 to 28 January 1871, the conflict was caused by Prussian ambitions to extend German unification and French fears of the shift in the European balance of power that would result if the Prussians succeeded. Some historians argue that the Prussian chancellor Otto von Bismarck deliberately provoked the French into declaring war on Prussia in order to draw the independent southern German states—Baden, Württemberg, Bavaria and Hesse-Darmstadt—into an alliance with the North German Confederation dominated by Prussia, while others contend that Bismarck did not plan anything and merely exploited the circumstances as they unfolded. None, however, dispute the fact that Bismarck must have recognized the potential for new German alliances, given the situation as a whole. Jules François Simon was a French statesman and philosopher, and one of the leaders of the Moderate Republicans in the Third French Republic. Jules Claude Gabriel Favre was a French statesman. After the establishment of the Third Republic in September 1870, he became one of the leaders of the Opportunist Republicans in the National Assembly. Louis-Jules Trochu was a French military leader and politician. He served as President of the Government of National Defense—France's de facto head of state—from 4 September 1870 until his resignation on 22 January 1871. Louis Joseph Ernest Picard was a French politician. Marie Joseph Louis Adolphe Thiers was a French statesman and historian. He was the second elected President of France, and the first President of the French Third Republic. Léon Gambetta was a French statesman, prominent during and after the Franco-Prussian War. Louis-Antoine Garnier-Pagès was a French politician and active freemason who fought on the barricades during the revolution of July. The Siege of Paris, lasting from 19 September 1870 to 28 January 1871, and the consequent capture of the city by Prussian forces, led to French defeat in the Franco-Prussian War and the establishment of the German Empire as well as the Paris Commune. The Battle of Villiers, also called the Battle of Champigny, was the largest of the French sorties from besieged Paris during the Franco–Prussian War. The Treaty of Versailles of 1871 ended the Franco-Prussian War and was signed by Adolphe Thiers, of the French Third Republic, and Otto von Bismarck, of the German Empire on 26 February 1871. This was a preliminary treaty used to solidify the initial armistice of 28 January 1871 between the two states. It was later ratified by the Treaty of Frankfurt on 10 May of the same year. The 1871 Treaty of Frankfurt made the decline of France obvious to the rest of the continent, and at the same time demonstrated the strength of a unified German empire. Pierre Philippe Marie Aristide Denfert-Rochereau,, was a French serviceman and politician. He achieved fame by successfully defending besieged Belfort during the Franco-Prussian War: this earned him the soubriquet the Lion of Belfort. The Commemorative medal of the 1870–1871 War was a French military campaign medal awarded to those who served during the Franco-Prussian War. 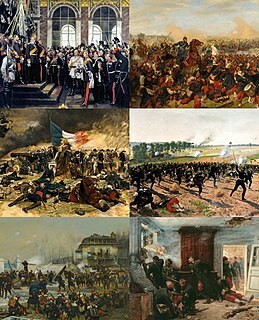 The Armistice of Versailles that came into effect on 28 January 1871 brought to an end the active phase of the Franco-Prussian War. The signatories were Jules Favre, foreign minister in the provisional Government of National Defence, for the French and Otto von Bismarck, chancellor of the newly established German Empire, for Prussia and her allies. The suspension of hostilities initially lasted until 19 February, when it was extended through 26 February, when a preliminary peace treaty was signed, also at Versailles. The definitive Treaty of Frankfurt was signed on 10 May. Although technically an armistice, the military position of France at the time and the terms were such that it was de facto a conditional surrender by the vanquished to the victors. Fort d'Issy was one of the fortifications of the city of Paris, France, built between 1841 and 1845. It was one of six forts built to the south of the main wall around the city. The fort was placed too close to the city to be effective, and had a poor design that did not take into account recent experience of siege warfare. It was quickly silenced during the Franco-Prussian War of 1870–71. After the armistice of February 1871 the fort was defended by National Guards of the Paris Commune against the French regular army in April–May 1871. The defense was irresolute and the fort was soon occupied. Today the site of the fort is an "eco-district", an ecologically friendly residential area.